A stimulating new vision, not least because Mustonen's music making always remains well-grounded and never appears to be manneristic. (...) thoroughly refreshing and convincing. (...) these are invigorating performances, with no small degree of poise in Mustonen's pianism and in his handling of the orchestra. (...) proves that Beethoven's popular piano concertos can be newly experienced time and again - till the very last note. When Olli Mustonen explores dynamic extremes, he never does it with violence, but with much sensitivity in his frail fingertips, and by all means in an elegant and flexible way. Especially in the romantic passages (...) he performs magic. This is the first of three volumes featuring the five Beethoven Piano Concertos and the piano version of the Violin Concerto on hybrid SACD, all performed by Olli Mustonen in the role as soloist and conductor of the Tapiola Sinfonietta. Mustonen is known for delivering a fresh, visionary reading of popular standard repertoire music, such as Beethoven's concertos which he has never recorded before. 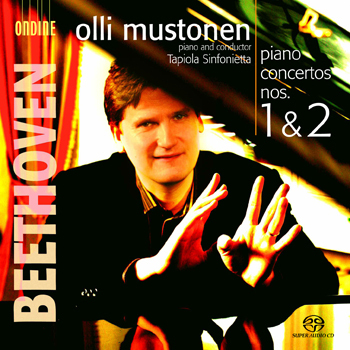 The chamber orchestra Tapiola Sinfonietta and Olli Mustonen have maintained a close relationship for years, accompanying this ambitious recording project with acclaimed tour performances. Mustonen, who is also a published composer, is playing his own cadenzas in the First Concerto. The booklet includes extensive liner notes written by the author of the new complete Piano Concerto Edition, Dr. Hans-Werner Küthen of the Beethoven-Archiv, Bonn.